RAM Seat-Mate is compact, portable, amazingly strong and no tools required are words that best describe the new RAM Seat-Mate. 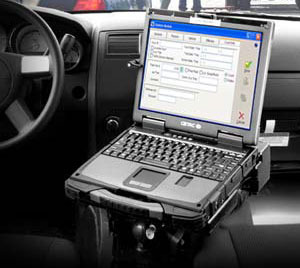 Able to transform most any passenger seat into a workstation, simply unpack the mount from the compact bag, unfold the legs, and buckle it in. Truly innovative in design, this product is able to actively hold onto the seat and stabilize itself. For anyone who needs a temporary mobile workstation, this mounting solution is absolutely perfect. 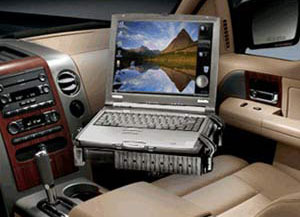 Designed to easily pack into a travel bag, suit case, or even under the seat of a vehicle, RAM makes it possible to create a comfortable workspace in minutes where ever your job takes you. 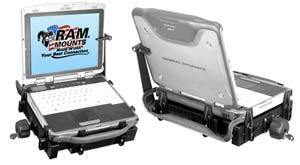 The RAM Seat-Mate is perfect for laptops, tablets, and UMPCs. The integrated rubber ball and socket system allows the user to achieve ergonomic viewing and typing angles. If youre a mobile professional, this product was designed for you. Apple iPad, iPhone & iPod Mounts RAM Mount offers Apple iPad, iPhone & iPod mounting solutions for motorcycles, cars, trucks, ATVs, airplanes and boats. 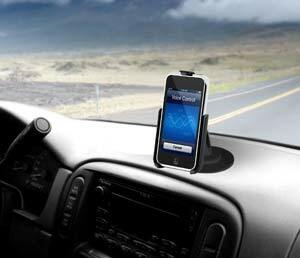 With a wide variety of mounting options available, RAM makes it easy to put your Apple device where it can be easily accessed and remain within a safe distance for tuning. Order a complete kit and an extra base of your choosing and transfer your iPad, iPhone or iPod with ease to another location. Simple design that will not block or interfere with any function of your Apple device. 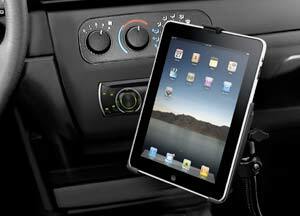 RAM POD I, universal No-Drill vehicle mount, for the Apple iPad. The base mounts to your seat rail without any drilling necessary. Connected to the base is a 18" rigid flexible rod that can be bent to position your device to it's optimum viewing location. The RAM POD I will hold everything you need safely and securely. 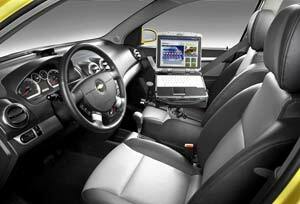 Stop fumbling with phones, laptops, and GPS systems. Come to Movin' On and let us find the right mount for your specific vehicle application. Because we're an authorized Ram Mounts distributor you know you're getting the right product at the right price.